Jongno Biz Hotel is a budget hotel located next to a shopping street in Jongno, and offers a convenient access to Jongno and Insadong street. The hotel used to be another hotel, and was renovated and opened as the second branch of Myeongdong Biz. 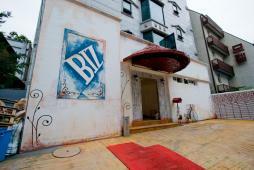 Same as Myeongdong Biz, the hotel provides a high quality service and accommodation with affordable rates. The hotel offers various services such as complimentary breakfast including congee, laundry service or internet connection. Staffs are extremely helpful and happy to assist guests with sightseeing information in Seoul. Guests can freely talk to the staff about anything they need. As the hotel is close to Jongno 3(sam)-ga station, subway line 1, 3 and 5, it is convenient to access anywhere in Seoul. Subway line 1 goes to City Hall, Seoul station and Yongsan, and subway line 3 is convenient to visit major tourist sites such as Gyeongbokgung and Gangnam area. Subway line 5 directly connects Jongno 3(sa)-ga station and Gimpo Int’l Airport. There are also many buses to Myeongdong area. Jongno is at the center of Seoul city, and guests can fully enjoy the convenient transportation to all areas in Seoul.